I’ve found some great collaborators. Amazing, actually. What I need now is a research intern or two! If you have some time to research the landscape of educational innovation and make this graphic as up-to-date and comprehensive as possible, please holler at me. I promise useful and interesting work. The Edupunks’ Atlas. This is an extension of the Edupunks’ Guide, supported by the Gates Foundation. Higher education is a vast and complex enterprise comprising varying missions, models and types of participants. Time and again, discussions over the future of the enterprise between, say, Ivy League classics professors and for-profit purveyors of online community college courses get bogged down in mutual incomprehension. 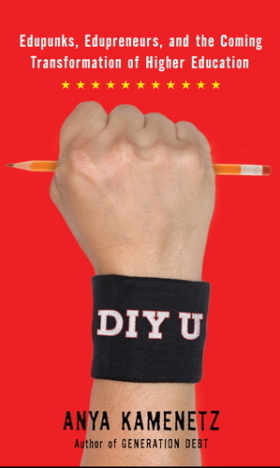 In numerous presentations over the past two years, I have presented as a framework, adapted from my book DIY U, three major buckets of benefits that higher education provides to students: Content, Socialization, and Accreditation; and three major challenges to traditional models: Cost, Access, and Quality/Relevance. The Edupunks’ Atlas of Lifelong Learning will use this framework as a starting point to create a beautiful full-color graphic map of the current landscape of higher education innovations, and variations on the theme. The Atlas will be made public at edupunksguide.org and as a free shareable graphic. The field is moving fast so I hope to create a framework that can be updated. be represented on the atlas. And maybe a few more I’m not thinking of. I need to find an awesome designer with interest in this field to help me think through and realize this graphic. You will be paid of course and get exposure as well. If interested please contact me at diyubook@gmail.com with samples of your work. I’ve been doing a lot of reading lately about the accountability movement in K-12. Results have been mixed, at best, but the impact has been so huge and is still growing. Well at long last it seems to be coming to higher ed now. [The GOP Governors of TX, FL and WI are] Mandating low-cost options like the $10,000 degree; holding down tuition prices, particularly at flagship institutions; tying funding to degree completion, particularly in fields deemed to be in “high demand”; paying faculty on the basis of performance, including how they fare on student evaluations; and likely asking the institutions to do it all with less state money. I can’t see much wrong, no matter how you look at it, with the mandate to offer radically low cost degrees and to hold down tuition even at flagship institutions. Students and families need this; our society desperately needs affordable higher education. I think it is political leaders’ jobs to use the lever they have, which is funding, to push the changes they want; and it is educational leaders’ jobs to push back by defending and articulating what is most important in their institutions and what needs to be preserved at all costs. I believe that real innovation requires cost pressures. Resources are not infinite and choices have to be made. There are HUGE questions, however, about how to actually measure performance in higher education. Tying funding to degree completion seems straightforward, but in reality it is anything but. Students transfer between institutions. They change their educational plans and goals. They drop out to start billion-dollar companies sometimes. Measuring the performance of professors by how well-liked they are by students is, frankly, a fool’s game as well. My best professors in college inspired awe and trepidation, not smiley faces. So how should we judge the value of education provided by institutions? But money is not the only good thing in life. There’s a ton of social science research on the non-financial returns to education. People with more years of education have better health. Happier relationships. Longer marriages. They vote more, are more established members of communities, are more engaged in volunteer work. Their kids reap the benefits of more education as well. The effects ripple across a society. In the age of big data, why not build a multidimensional longitudinal study of all of these returns on education for students at specific universities? Numbers counts. What we measure, we manage. Three out of four college students officially qualify as “nontraditional” in some way: They have no high school diploma, enrolled more than one year after high school, are independent from parents, work full time, or are parents themselves. These students tend to face a series of personal and financial hurdles that put the odds of graduation against them. [url=http://portmont.la.edu/]Portmont College at Mount St. Mary’s[/url], a new nonprofit college opening this fall, takes these challenges on, inviting highly motivated students, regardless of their prior academic preparation, to experience a low-cost education combining the latest technology with a holistic personal approach banking on some surprisingly old-fashioned liberal arts values. This is a new level of educational intervention for the Gates Foundation, which is funding Portmont through the MyCollege Foundation with $3 million in partnership with a small private Catholic college (which provided a fast track to accreditation). The model throws several Twitter feed’s worth of this-minute ideas for educational innovation into the blender and presses puree. Srikant Vasan, the Gates Foundation’s first entrepreneur-in-residence, grew up in India and attended the Indian Institute of Technology. He started and sold two software companies before turning his attention to education. “We’re bringing together what a lot of the research says is correlated with success in college,” he says, referring to findings by people like psychologist [url=http://www.nytimes.com/2011/09/18/magazine/what-if-the-secret-to-success-is-failure.html?pagewanted=all]Martin Seligman[/url] and economist [url=http://chronicle.uchicago.edu/040108/heckman.shtml]James Heckman [/url]that “non-cognitive skills” like persistence and optimism are more likely to determine success than straight scores on standardized tests. “I think we’re one of the first institutions to target personal characteristics like grit, character, and motivation as primary for admission.” To find these students, Vasan is reaching out to charter school networks and community programs like City Year, [url=http://www.fastcompany.com/social/2008/profiles/year-up.html]Year Up[/url], and YouthBuild. What’s different about Portmont starts with the recruitment process. Prospective students will be asked to take a three-week free online course called LaunchPad (the first one starts December 10). The course will include psychological assessments and an introduction to the college’s core ideas, like believing in yourself. Meanwhile, Portmont’s proprietary analytics platform–developed by a CTO with expertise in the financial services industry–will be tracking each keystroke to help determine the student’s motivation and other qualities, data that will be combined with an interview to forecast the student’s chance of success. Once they’re in, Portmont students will meet up for a one-week, one-credit intensive orientation where ideally they’ll bond with their classmates and the personal “success coaches” that are part of Portmont’s faculty, before heading back home to work on a largely online curriculum. They’ll return once every eight weeks to take part in group-project-based learning and presentations. The idea is to combine the best of online learning–self-pacing, convenience, and an analytics-powered dashboard that provides instant feedback to teacher and student–with some of the benefits of face-to-face education, while still keeping total costs low. Portmont will cost $5,240 per student, an amount entirely fundable with need-based Pell Grants, so that students can graduate debt free. Portmont’s goal is to prepare students to demonstrate mastery in the skills employers want most. “There’s a real disconnect between what higher education offers and what employers are expecting,” Vasan says. “Our way is to offer you not only the degree but credentials in core capabilities like critical thinking, problem solving, communications, quantitative literacy, and teamwork.” The same data tracked on the dashboard that shows your progress while you’re in school can be made visible as a digital portfolio, to show employers why you scored a 4.2 out of 5 on teambuilding, for example. Vasan is recruiting a few hundred students for the first year, but his goal is to reach 4,000 students nationwide within a few years, a level at which the program will be self-sustaining on tuition with no additional funding. They’ll grow by partnering with on-ground campuses with similar missions. First up: Denver and San Francisco. I traveled to Nicaragua this June to report a piece on the One Laptop Per Child project, which is published in the current issue of Fast Company. I also gave a presentation on what I found at Jon Kolko’s/ Austin Center For Design’s “Design Extravaganza” a really fun little conference a couple of weeks ago. The case study of OLPC really intrigues me and even after months of research, talking to all the principals in the organization and seeing it in action, I still don’t completely know what to think. ON the one hand, it’s a cautionary tale about overpromising and underdelivering on the role of technology in education. On the other hand, it’s an inspirational achievement. You have to admire Negroponte and his team for sticking to their principles of open source IT tools without fixed curricula which in the best of scenarios, allow for true self-directed learning and exploration. It’s such an intuitively appealing idea, even if it doesn’t always work. The results of a two-year Senate investigation into the for-profit college industry describe a system where the interests of shareholders come above the interests of students. That’s especially problematic given that the industry is almost 90% funded by taxpayer dollars, which pour into a system barely filtered by weak regulations. Publicly traded companies like Apollo Group (U of Phoenix), DeVry, and Corinthian Colleges enroll three-fourths of for-profit college students. These companies average a whopping 19.7% profit margin. They do that by focusing on online marketing and recruiting, using search engine optimization and high-pressure direct sales tactics familiar from the pre-crash mortgage industry. In a way, these colleges work like your less-friendly local gym. They sign up lots and lots of students. But once they collect your first semester’s tuition, capturing an increasing slice of total federal student aid funds (including one in four of all Pell Grant dollars issued), they don’t really care if you come back. Actually, it’s cheaper for them if you don’t. So they plow the money back into marketing and recruiting rather than student support and career services. Most students who sign up leave within a median of four months–with debt and without a degree. This goes a long way toward explaining how for-profits, which enroll only one college student in 10, account for half of all federal student loan defaults. A particularly upsetting part of the report focuses on these schools’ marketing to enlisted military and veterans. Their GI Bill benefits are subject to a loophole that allows these colleges to get even more than 90 percent of their revenue from the federal government. For-profit colleges, as the Senate report argues, have the potential to be an important part of the higher education system, expanding access to working adults with online programs. Some smaller, local, specialized trade schools offer associates’, bachelor’s and even graduate degrees with great connections to jobs. But these colleges cost far more than the community colleges they compete with. Better regulations could rein in the industry, but that might be difficult. These companies gave almost $700,000 to political campaigns in the first half of the year, including to several Republicans in tough races, but nothing at all to President Obama. Really great audience, great questions! I also had a meeting to talk about H20, the open law casebook worked on by Jonathan Zittrain that is coming out of beta very soon.